How Intense Competition Marks the eCommerce Domain? 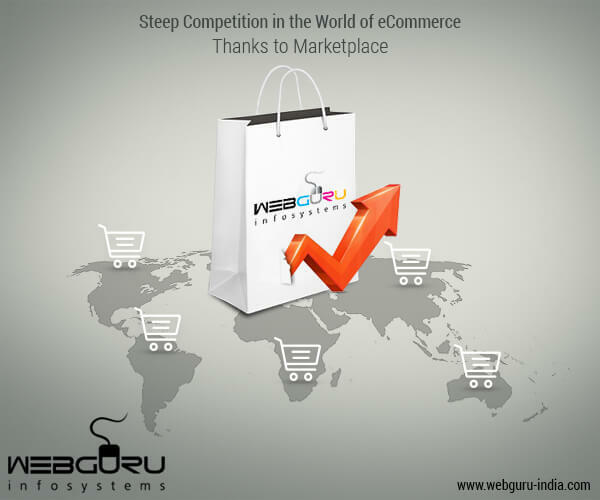 How a Marketplace is Raising the Competition in the World of Ecommerce? The world of ecommerce is rising in leaps and bounds. When you are a businessman, you know the significance of online store and market. Competition is really steep and expectations very high. Herein, the online marketplaces are setting up a new trend and this trend is enhancing the competition in the world of ecommerce. Cooperation is one of the fundamental concepts in the world of business and marketplaces are exploring this concept further. Marketplace websites support third-party vendors. They sell their products and services and get a certain portion of money generated through each transaction. Some new trends have emerged after the advent of marketplaces and they are contributing to the already rising competition in the market. Entry barriers for brands in marketplaces is low. You need not have to design or develop a selling platform. You get an already established one. Only investment you need to put in is a small amount of listing fee and a percentage of each transaction to be paid to the shared selling platform. A marketplace is a profitable option for the start-ups. Compared with the creation of a separate selling platform, the costs incurred when you enroll your brand with a marketplace is much lower. This cost reduction is enhancing the level of competition in the world of ecommerce wherein, the site developers are reducing the development costs for individual online selling platforms. Setting up of a storefront is easy and fast when you have opted to sell your products or services on the domain of marketplace. Most of the marketplace platforms let you create your seller-account within a few minutes. Within the same day, you will be able to upload product listings as well as start selling. When you go for setting up an individual selling platform, you need to wait for weeks before the website is launched and get ready for real transactions to take place. This is a very appealing attribute of a marketplace. Time is more limited for an ecommerce website developer who needs to deliver the website within a short span thereby further raising the level of competition. When you enroll your brand on a marketplace, you get a larger base of untapped audience. Wal-Mart, Amazon, Best Buy, eBay, Sears and Etsy.com have their individual marketplaces. When you enlist your brand on any of these platforms, your products and in the way your brands are put in front of a larger audience base. This is a wonderful way to reach out to more customers. Reaching out to a larger audience base is not enough. With this, your responsibility rises up. You need to understand the latest trend in the market; understand the sentiments of customers in a better manner. In addition, you should perform a thorough research upon the strategies adopted by your competitors. Enrolling with big marketplaces is a tad difficult for local brands to achieve desired business aims. Local brands should focus upon targetting the buyers of local market, which is quite difficult to achieve when one enlists with sites like Amazon or eBay. Some proficient ecommerce design and development companies create local marketplaces. Products like meat and poultry; fruits and vegetables; herbs and spices could generate best business through locally targeted marketplaces. Such local marketplaces are again raising the competitive spirit of the ecommerce industry. High quality services are expected from them to serve the aspirations of local brands. After giving your brand and product a better exposure, marketplaces offer you a better opportunity for exploring new markets in an affordable manner. You need not have to invest in marketing resources or build a new online store in order to test a new market. You can select a few different types of products to be enlisted on a marketplace which serve as a new market for your business. Above mentioned way is a low risk way to test a new market. If in this way, you are able to increase revenue in an ecommerce store, you can enhance the variations and numbers of products. Otherwise, you avoid the risk of wasting lots of money and time. I love market place because it’s cost effective and very easy to set up !!! Very informative post. Now a days we can see that there is a huge boom of the eCommerce market, because as you can see that era has been changed, this is the era of technologies….. We are living in advanced world, some years before we go to the market buy anything but now we can get these thing without go anywhere, How..?? Because of ecommerce sites arsing and these options come in the market, now we can see that how people are satisfying and enjoying this facility and due to this turn over of the commerce market increase millions $.. and infibeam.com is the eCommerce sites listed in IPO. E-commerce is becoming vast perspective information for the start-up companies and they give chance to win the trust and reputation throughout the marketplace by placing an efficient amount of services with continuous betterment. Thanks a lots for shearing this useful blog. E-commerce is very important for the start-up companies and they give chance to win the trust and reputation throughout the marketplace. Thanks for sharing the blog.